FORT COLLINS, CO--(Marketwire - April 14, 2010) - OtterBox, makers of protective technology cases, was recognized last night with the 2010 Creative Business Solutions Award from the U.S. Postal Service (USPS). 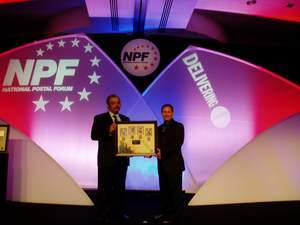 This prestigious award was presented during the National Postal Forum (NPF) ceremony held at the Gaylord Opryland Hotel in Nashville, Tenn.
Sylvester Black, Area Operations, Western Area, selected OtterBox for the Creative Business Solutions Award which pays tribute to companies who recognize the vital importance of innovation, teamwork, communication and customer satisfaction in partnership with USPS. Bonnie Jimenez, OtterBox Global Sourcing Director, played a primary role in forming the strategic partnership with USPS. Jason Strong, Purchasing Manager at OtterBox, accepted the award on behalf of the company. "OtterBox is thrilled to be recognized as one of the most dynamic and robust supply chain organizations in the United States," Jimenez said. "In today's economy, a company needs to be functional and creative to eliminate waste from a supply chain and partnering with USPS has allowed OtterBox to shorten delivery time, reduce cost and enhance our branding strategy." Working with USPS as a strategic partner, OtterBox not only meets shipping needs, but also saves money. Transitioning to co-branded USPS cartons has saved OtterBox over $20,000 a month. Plus, the boxes are 100% post consumer so they are more environmentally friendly. "We are honored by this award and look forward to growing our relationship with USPS as a strategic supply chain partner," Jimenez said. Built upon fundamentals of hard work, innovation and perseverance, OtterBox is a leader in the production of premier protective solutions for global handheld manufacturers, wireless carriers and distributors. OtterBox was founded in 1996 and is headquartered in Fort Collins, Colo.
For more information, visit www.otterbox.com or call 888-695-8820. OtterBox -- We've got technology covered. Jason Strong (right), OtterBox Purchasing Manager, accepts the U.S. Postal Service Creative Business Solutions Award at the National Postal Forum ceremony April 13, 2010.